SEOUL - North Korea on Wednesday called a visit by Japan's prime minister to a Tokyo war shrine "a grave insult," in its first official reaction to the pilgrimage that enraged Seoul and Beijing. Japanese Prime Minister Junichiro Koizumi on Tuesday paid his respects at Yasukuni Shrine, where Japanese World War Two leaders convicted as war criminals along with 2.5 million war dead are enshrined. South Korea and China consider the visits to Yasukuni as symbolic of Japan's refusal to come to terms with its history of colonisation and aggression during World War Two. "The reality goes to clearly prove that Japan is a cancer-like entity in preserving regional peace," the North's KCNA news agency said, adding Koizumi's visits to Yasukuni were "a grave insult and challenge to the peoples of Asian countries that fell victim to Japan's invasion." "This is a blatant challenge to the just voices of the peoples of Asia and the rest of the world and a revelation of the Japanese ruling quarters' 'political will' to restart overseas aggression by stepping up the militarisation of the country," it said. The North's official media routinely criticises Japan, which colonised the Korean peninsula from 1910 to 1945. 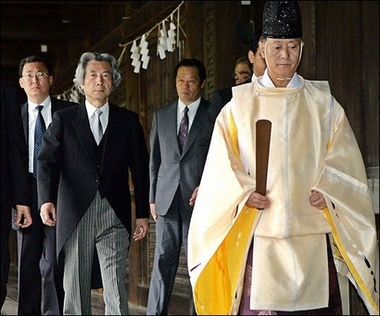 Koizumi has said he goes to the shrine to pray for peace. His pilgrimage was the first by a Japanese prime minister on the August 15 anniversary of Japan's World War Two surrender since Yasuhiro Nakasone went there on that emotive date in 1985. On Tuesday, China said Koizumi's shrine visits were "wrecking the political foundations of China-Japan relations" and summoned Japan's ambassador to register its protest. South Korean Foreign Minister Ban Ki-moon said: "The Japanese prime minister's visit to the Yasukuni shrine is a total disrespect for the Korean government and people, particularly on our independence day and the day of the end (of) World War Two."